(Nanowerk News) A team from Carnegie Mellon University’s National Robotics Engineering Center is building a new class of robot to compete in the Defense Advanced Research Projects Agency’s (DARPA) Robotics Challenge — a human-size robot that moves, not by walking, but on rubberized tracks on the extremities of each of its four limbs. Though the appearance of the CMU Highly Intelligent Mobile Platform, or CHIMP, is vaguely simian, its normal mode of locomotion will be much like that of a tank, with the tracks of all four limbs on the ground. This configuration would offer a particular advantage when moving over debris and rough terrain. But CHIMP also can move on the treads of just two limbs when needed, such as when it must use one or more limbs to open a valve, or to operate power tools. CHIMP will have to do that and more during the DARPA Robotics Challenge (DRC), in which robots will have human-like capabilities to respond to calamities such as the 2011 Fukushima nuclear plant disaster. Climbing ladders and driving vehicles are among the obstacles robots will face in environments engineered for people. 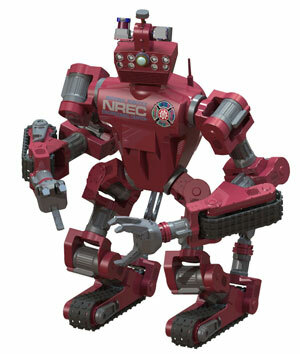 The NREC entry, Tartan Rescue Team, is one of seven selected by DARPA for DRC Track A, in which each team will develop its own hardware and software. The team has launched a new website, www.tartanrescue.org, with details about CHIMP, team members and sponsors. CHIMP will be able to perform complex, physically challenging tasks through supervised autonomy. A remote, human operator will make high-level commands controlling the robot’s path and actions, while the robot’s on-board intelligence prevents collisions, maintains stability and otherwise keeps the robot from harm. The robot also will be pre-programmed to execute tasks such as grasping a tool, stepping on a ladder rung or turning a steering wheel without step-by-step direction from the human controller, circumventing the lag between command and execution. “This type of robot has tremendous potential,” he added. Such a robot would be suitable for a variety of tasks for which NREC now develops wheeled, tracked and other conventional robots, such as remote inspection and monitoring of hazardous industrial facilities. A unit of Carnegie Mellon’s Robotics Institute, NREC performs advanced applied research and prototyping for commercial and governmental clients. The human-centered nature of the DRC challenges would seem to favor a dynamically stable humanoid robot, the choice of five of the seven Track A teams, Stentz acknowledged. But his team’s focus on simplicity and dependability led them to choose tracked locomotion. “When we walk or stand, our brains are actively controlling our balance all of the time,” Stentz noted. This dynamic balance makes people nimble and enables them to run. But it also greatly increases the complexity, computational requirements and energy consumption of a machine. So CHIMP is designed with static stability; it won’t fall down even if it experiences a computer glitch or power failure. When necessary, however, the operator can control CHIMP’s individual joints, enabling it to adapt its motion to particular circumstances or extricate itself from tight spots. “In a pinch, it can do anything,” Stentz said. The operator controls CHIMP using an immersive interface of a large screen monitor, keyboard and mouse, choosing from multiple modes that blend manual and autonomous control of the robot. Other team members include Clark Haynes, NREC senior robotics engineer; Alonzo Kelly, professor of robotics; Eric Meyhofer and David Stager, both NREC senior commercialization specialists; Siddhartha Srinivasa, associate professor of robotics; Drew Bagnell, associate professor of robotics and machine learning; Herman Herman and Bryan Salesky, both principal NREC commercialization specialists; and Maxim Likhachev, assistant research professor of robotics. Steve DiAntonio, NREC business development director, said the team is seeking additional sponsors. In addition to the Tartan Rescue Team, Carnegie Mellon has a second team in the DARPA Robotics Challenge. Team Steel, headed by Christopher Atkeson, professor of robotics and human-computer interaction, was selected as a Track B team. In Track B, teams develop software in a virtual competition, with a winner receiving a DARPA-provided humanoid Atlas robot for use in the live competition. The final DRC event will be next year, with the winner receiving $2 million.